I love large wraps/shawls but am usually frustrated when they invariably slip off the shoulder and go missing in terminals and malls. A very good thing– it’s worn on the plane and doesn’t take up precious suitcase space. The shawl is also an excellent shopping accessory. It’s stylish and is an extra layer of warmth in air conditioned malls. I live in MN and winter is brutal, requiring a heavy coat which is always stifling once in a store. I can wear a lighter coat plus a shawl and be comfortable in the parking lot and shopping. 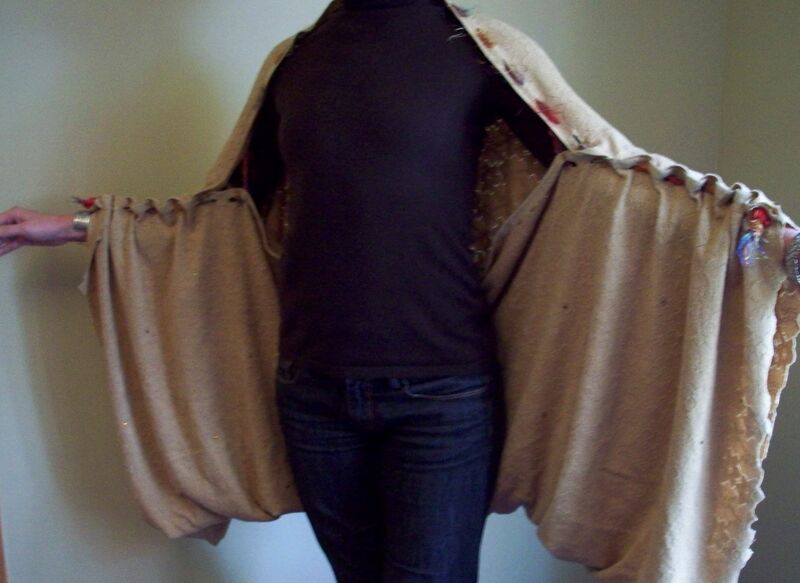 However, a fix is needed for the constantly misbehaving shawl, and I finally found one solution in a no-sew cocoon shawl that has sleeves and can be easily reconfigured into a blanket. The design is inspired by a Pin from a 2013 The Row Collection. The loose, drapey fit and the sleeves were appealing. An ‘A Ha’ moment connected sleeves and drapey fit with A Shawl, A Cocoon Shawl. Of course, I had the perfect fabrics in my stash. They had been purchased specifically for shawls but had been wasting away as I knew when worn, the shawl would slip and soon be tangled in my arms, purse, or worse, legs. The fabrics are two pieces of a soft, knit lace (flower motif), in black and kakhi. Although the fabric is a bit clingy, I knew it would never be secure on my raincoat which is a perfect travel coat–rain and wind proof, and a good layering piece. So, if sleeves could be added, even if it slipped, arms would keep it on the body. I began to have an elusive idea on how to accomplish this and it finally emerged with the help of my daughter, the Curator. She provided the body for the draping, pinning, twisting, wrapping…until it all ‘Came out Right’. What made it work, is the fabric selvedge–the lengthwise fabric edge that is attached to the loom. This one has large openings just begging for string, cord, something to shape the fabric without actual stitching. 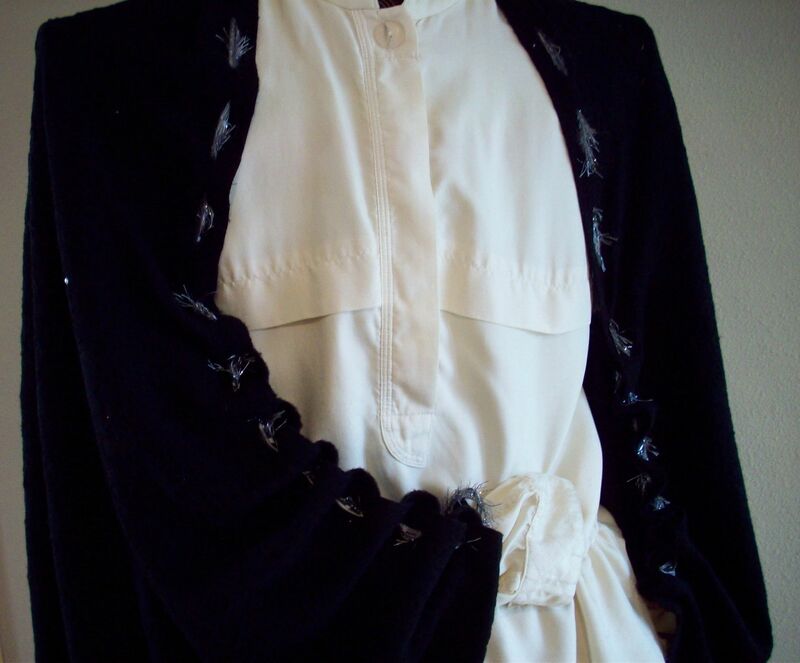 So, the sleeves and ‘cocooning’ were solved by lacing the two selvedges together and leaving an opening for arms by lacing through one layer over shoulder and neck. Multiple yarns, threads, leather were combined for the lacing cord and are secured at the wrist by toggles that allow for sleeve length adjustment. String lacing cord(s) through selvedge openings in both layers to form sleeve; continue lacing through one layer for neck and then two layers again for other sleeve. Sleeves should be equal in length. 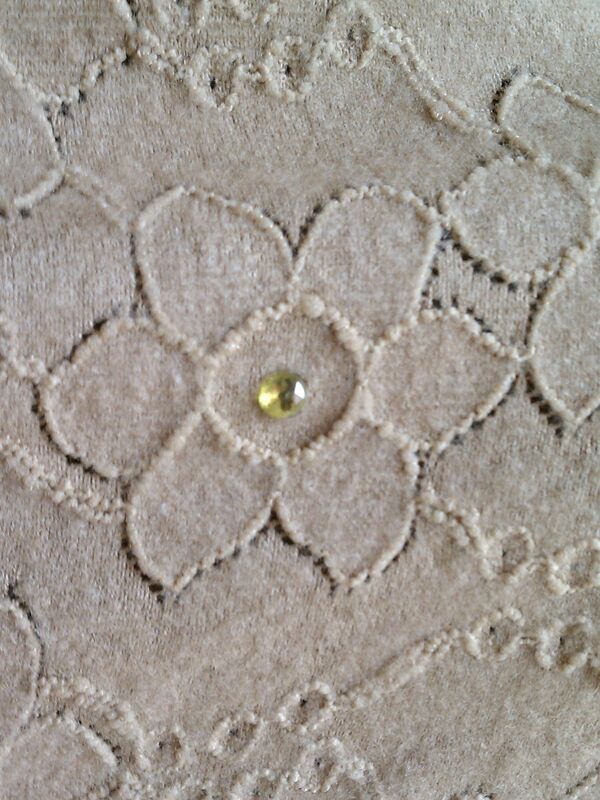 Add decorative beads as desired. Finish with toggle at each wrist to adjust sleeve length and prevent cord from pulling out. Openings for lacing can be made using gromments or making button holes. Punched holes may work if fabric won’t stretch or ravel. 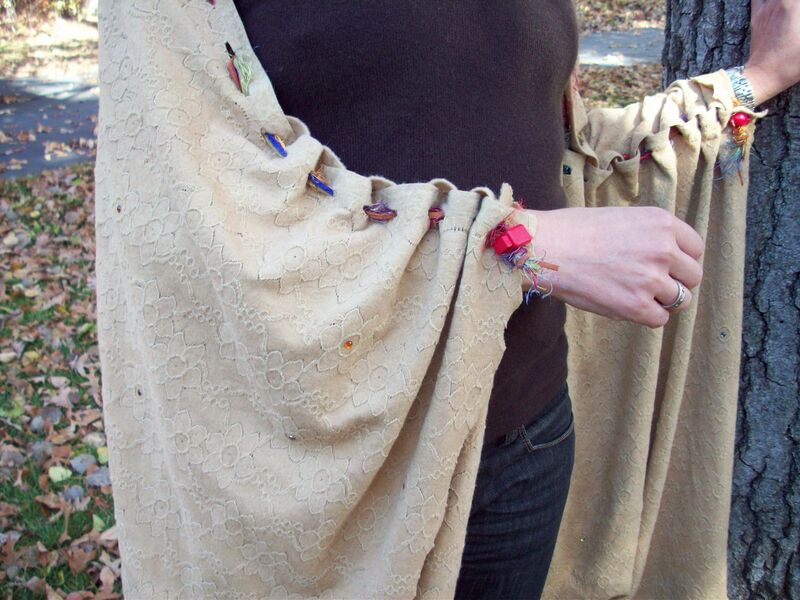 45″ wide fabric will make a much shorter cocoon shawl; experiment. 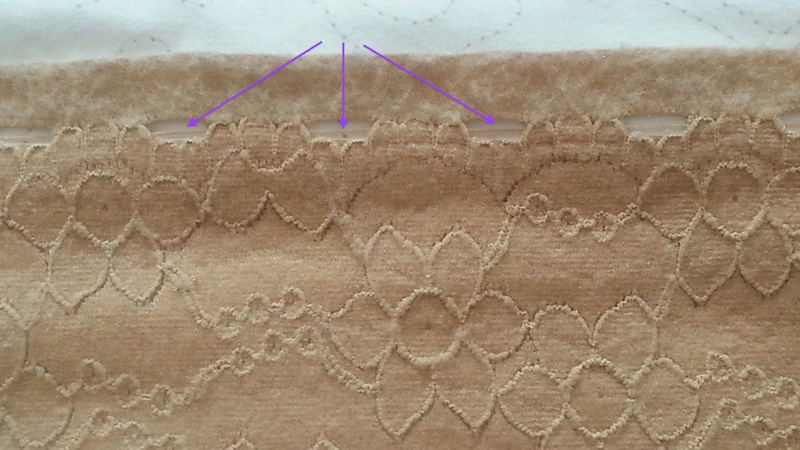 Sleeve hem is trimmed around lace motif and left raw as the knit will not ravel. 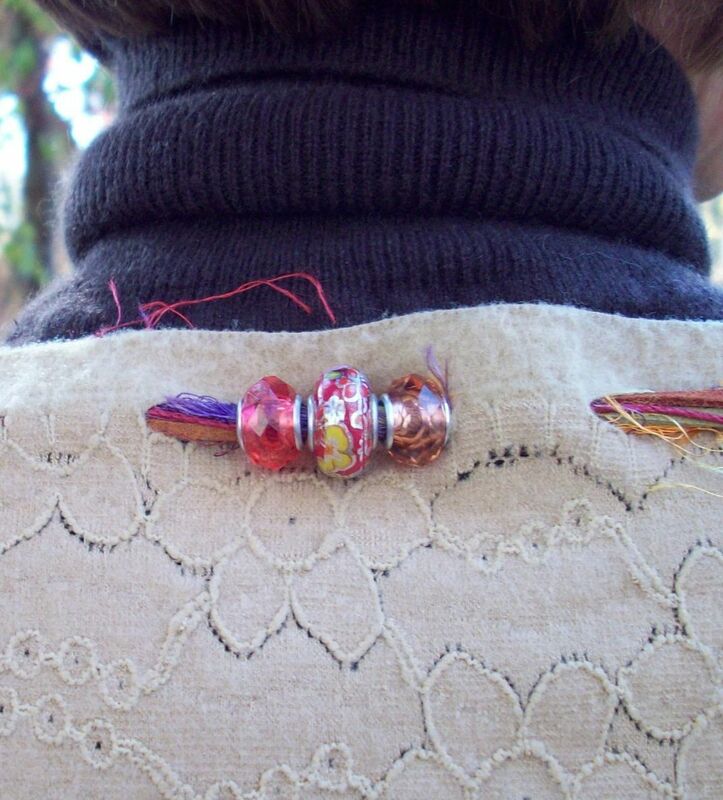 Laces can be removed for use as single layer blanket. Even though the shawl slips off the shoulders on this raincoat, the sleeves/arms keep it secure. 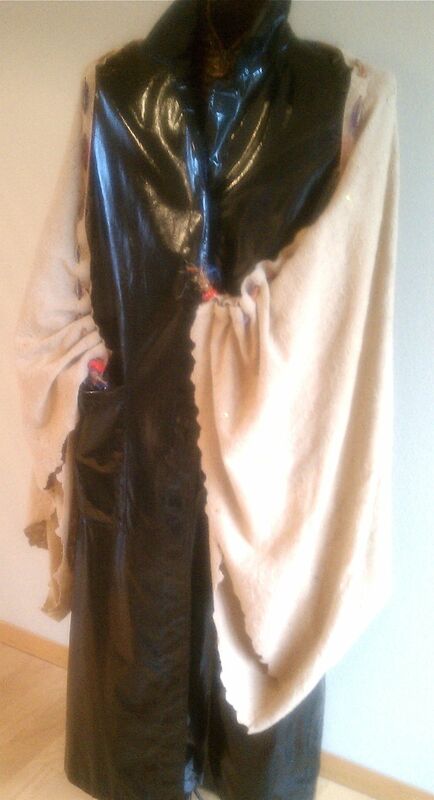 Both the black and kakhi Cocoon wraps are available on Etsy. Now, here is another very similar (in technique) version from Threads Magazine, September 2014, Number 174. 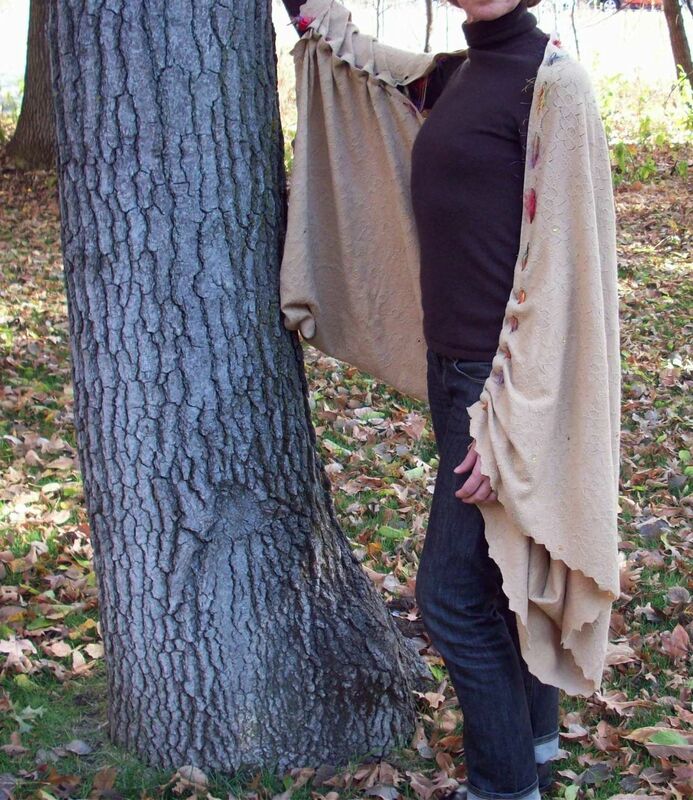 Let me know your experiences with making a cocoon shawl. 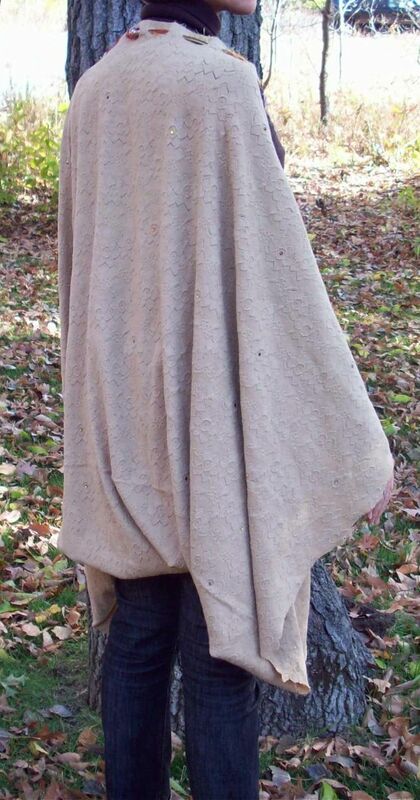 This entry was posted in FIBER FASHION FUN and tagged cocoon, instruction, knit, number 174, Pleated Wrap, shawl, The Row, Threads, travel, wrap. Bookmark the permalink.